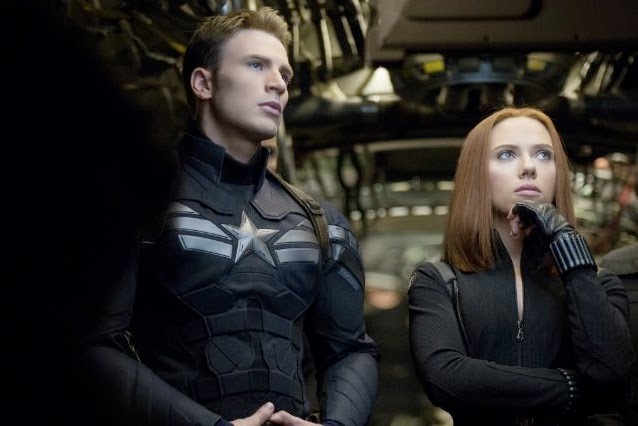 Chris Evans and Scarlett Johansson suit up in "Captain America: The Winter Soldier." The main problem with "Captain America: The Winter Soldier" isn't that this sequel to 2011's "Captain America: The First Avenger" misguidedly shifts the costumed comic-book superhero into high-body-count political thriller mode. What's more bothersome is that instead of being an effective allegorical indictment of US "murder by drone" policies, Big Brother spying and general might-makes-right military madness that it seems to condemn, the movie ultimately lets real-world villains off the hook for similar transgressions by blaming them on outside forces here. Pitting Cap and his cohorts against the President of the United States, the majority of our elected representatives and the heads of our defense and intelligence agencies for turning America into an intrusive, belligerent and oppressive police state would have taken guts. Making an outside terrorist organization take all the blame for the past half-century's worth of America's misdeeds, on the other hand, seems more timidly craven than childishly naïve. What next, a Spider-man movie blaming the fall of the Twin Towers on Doc Ock? In the Marvel cinematic universe, SHIELD is an international espionage and enforcement organization overseen by a World Council and run by the intimidatingly no-nonsense Nick Fury (Samuel L. Jackson, badass as always). On the eve of launching three massive flying warships with the capability of killing thousands of suspects a minute before they get around to committing any actual crimes, Fury discovers that SHIELD has been infiltrated at every level. Turns out that Hydra, a Nazi spinoff group formed by the Red Skull in the last movie, secretly has been pulling the strings of US foreign policy ever since its scientists were brought over to our side following World War II. Man-out-of-time Steve Rogers, aka the super-soldier Captain America (Chris Evans) who was thawed out after almost seven decades on ice, has become increasingly uncomfortable with Fury's situational ethics and manipulative compartmentalization. "Getting tired of being Fury's janitor," as he puts it, Cap is clearly troubled when Fury describes the new Project Insight, which is designed to rain massive preemptive death-from-above on whomever its algorithm says might be a potential future threat. Rogers notes that he fought in the '40s to keep people free, but that "this isn't freedom, this is fear." In a more courageous movie, the obvious NSA and drone parallels instantly would be sufficient to put a freedom-and-liberty loving Captain America up against not only SHIELD but any government that would approve such a project. In this movie, it's only when Cap personally comes under attack and realizes the project won't be supervised by what are supposed to be the good guys that he decides to sabotage it. The movie's attempt to play all of this straight has the paradoxical effect of making it less credible (and far less fun) than the wild fantasy of something like "Thor: The Dark World," another Marvel flick scripted by this film's writers (Christopher Markus and Stephen McFeely). Plot holes and other problems become more annoying in a setting that's supposed to be taken this seriously. Why does a mindless, controlled-by-intermediaries assassin show up at the head villain's home one night simply to sit in the dark and glower? Why can't any of the multitudes of well-trained, high-firepower bad guys seem to hit the broad side of a barn? How could Cap possibly think that a glass-front vending machine would be the best place to hide a protect-at-all-costs memory stick? And because we know from "The Avengers" that there are plenty of other superheroes around, why doesn't Captain America, Nick Fury or anyone else pick up a phone to get some heavy-hitter backup? After all, the fate of 20 million people is at stake. "Iron Man 2" and "The Avengers" costar Scarlett Johansson is back as the cool-but-getting-warmer Natasha Romanoff, aka The Black Widow. Anthony Mackie appears as a likeable and cleverly re-imagined version of the comics character known as The Falcon. The very weak link in the cast is Robert Redford. As Fury's boss Alexander Pierce, Redford seems too self-amused to bother putting forth any effort at making his character even remotely believable. Directors Anthony and Joe Russo do a serviceable if not especially stylish job. A CGI-extravaganza action finale almost seems like an afterthought, complete with the requisite hero beatdown. Parents also should be aware that unless your little ones already have become thoroughly desensitized to things like massive amounts of machinegun mayhem, which certainly is possible, this flick isn't very kid-friendly. Then again, neither are most comic books these days. Stick around for two bonus scenes, one midway through the credits and one at the end. Also, watch for Marvel Comics icon Stan Lee in one of his better cameos.